Riot, Insurrection, Rebellion, or Uprising? All Americans alive in 1967, of all races, called Detroit’s five day long spasm of violence, arson, and looting in July 1967 a riot. Some labeled it a race riot, others just a riot. Not for long. Within a year, government and media were plying the public with a long list of racial grievances said to be responsible and an even longer list of expensive liberal programs which promised to cure them. The Detroit riots were deceitfully recast as an insurrection, rebellion, or an uprising to drive those liberal programs, but ultimately this revisionism just glamorized base criminality, Fifty years later, billions have been doled out in Detroit through those liberal programs and Detroit is in even worse shape by every metric. Note that the definitions of insurrection, rebellion, and uprising all state that these events are a defiance of established government, while the definition riot does not. Were the events in Detroit from 23 to 27 July 1967 a defiance of established government? Start with the property damage. 412 buildings were burned out. 2,509 stores were looted; many of these wound up being torched as well. 388 families were left homeless due to damage to houses and apartment buildings. How much of this damage was inflicted upon government property? Government casualties were remarkably light for an event now characterized as defiance of established government: 1 DPD officer, 2 DFD firefighters, and 1 Michigan ANG Corporal. The DPD officer was shot by another DPD officer in a friendly fire incident; 1 DFD firefighter was electrocuted after stepping on a downed power line; and the Army National Guard Corporal was shot in crossfire between the National Guard and looters. Only the second DFD firefighter was deliberately shot dead by a civilian. Two probable snipers were killed, one by DPD and the other by Guardsmen. No one was convicted of sniping at police or military personnel afterwards, despite a widespread frenzy of rumors during the riots. The sad truth is that the Detroit law enforcement casualties in 1967 are not markedly different from those today, in a Detroit with half of its 1967 population. 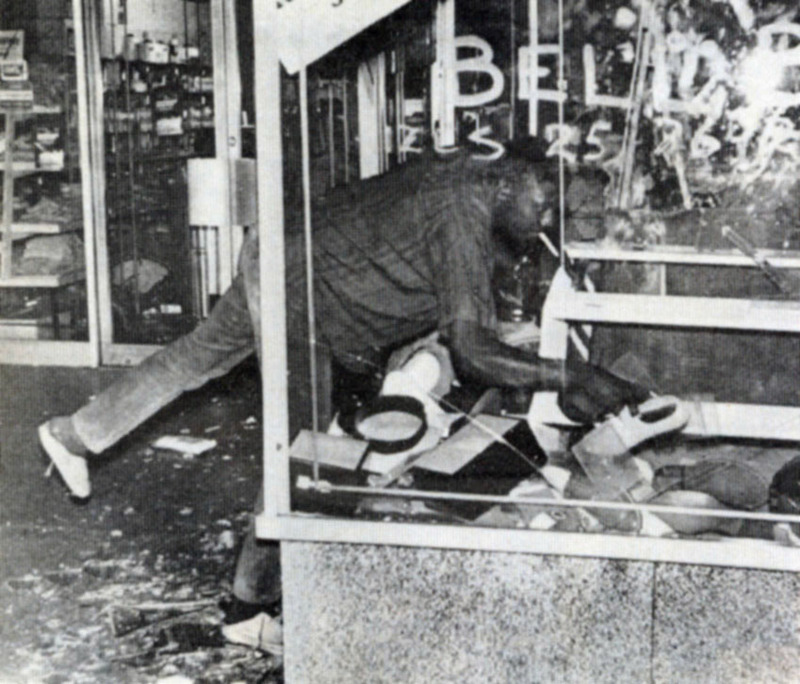 The vast majority of casualties involved individuals looting from stores and private property. Not exactly defiance of established government. The government was not targeted by rioters, stores were. The National Advisory Commission on Civil Disorders (Kerner Commission) report delivered in 1968 was the first to characterize the riots in 1967 as defiance against established government. 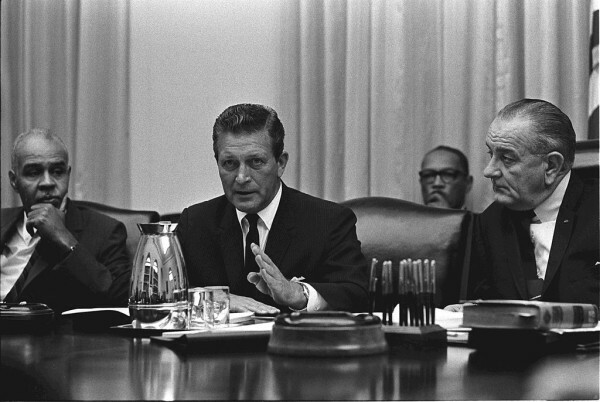 The Kerner Commission was devoted to expanding Great Society spending programs and ignored this counterfactual: Detroit exploded, while Southern cities with revanchist, neoConfederate governments did not. This counterfactual is particularly pointed, because Detroit’s hard left Democratic Mayor, Jerry Cavanagh, had lavished $ 360 million ($ 2.8 billion in 2017 dollars) in Great Society money on the communities which rioted, before the riots. Detroit was touted as a ‘Model City’. Even President Johnson, who empanelled the Kerner Commission, knew that their conclusions were fatuous and ignored them. He knew that more spending was a lost cause. Detroit got no bonanza of new money. 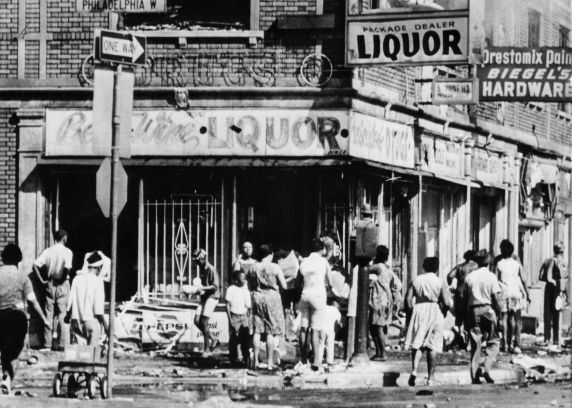 The damage and mayhem of the 1967 Detroit Riots were a concerted attack on private store proprietors, but that is not an insurrection, rebellion, or uprising. That is a good old fashioned riot. You don’t have to get bogged down in the personal motivations of the rioters to exclude insurrection, rebellion, or uprising as proper descriptors. The actions of the rioters speak volumes. This was a riot. Applying any other name to the events of 23 to 27 July 1967 in Detroit is blatant historical revisionism designed to obfuscate what actually happened. Rule of Law collapsed in Detroit during 1967 and has never been fully restored. Rule of Law is the sine qua non of economic growth. Businesses will not return to Detroit and hire Detroiters until Rule of Law is reestablished. Rule of Law distinguishes modern, vibrant economies from wretched, third world hellholes. t is important to tell the truth about Detroit 1967 if the city is ever to be pulled out of the economic death spiral which ensued. The insurrection/rebellion/uprising deceit attempts to absolve rioters and their criminal posterity of responsibility for its economic collapse. That collapse was a direct result of all those shop keepers heading for the suburbs, with all of their jobs. Taxes, bad schools, and insane municipal regulations didn’t encourage them to stay, but personal security was their paramount issue. Can’t blame them, they were no longer safe in Detroit and they knew it. Small businesses and the jobs they generate are essential to the recovery of Detroit. Detroit will not recover until suburbanites become comfortable working in Detroit’s outlying neighborhoods. The Potemkin Village created downtown, at great expense to all of Michigan, on 5% of its land area will never improve the lot of Detroit residents. Detroit’s downtown has 26,000 residents, about 4% of its population. Most of the workers and visitors there are suburbanites attracted by a small island of peace and tranquility. Convincing proof that Rule of Law can engender growth, even in Detroit. Truth and the Rule of Law are most important to today’s African-American residents of Detroit, who now account for 82.7% of its population. The insurrection/rebellion/uprising deceit may provide them with false comfort, but it certainly does not help them economically. That is why Detroit has fewer African-American residents today than it had in 1967. The departed voted with their feet, and the polls are still open. The only real election in Detroit. Thank you 10x25MM. I was 12 years old, staying with my grams on Ohio on those days. I watched and waved from her balcony to the guards driving down Ohio in big green vehicles--Ohio being the most direct route to the riots. I could see their rifles which did not alarm me, guns didn't create hysteria back then. There was not the news all over TV like now--but remember the freeways were closed to traffic and vaguely remember my grams telling me I could not go outside and only told that my father would be delayed in picking "us" up, as grams was coming home with me. While on the balcony, I waved to my friends across the street. Only saw them once more--the day my grams moved from that really great house on Ohio. 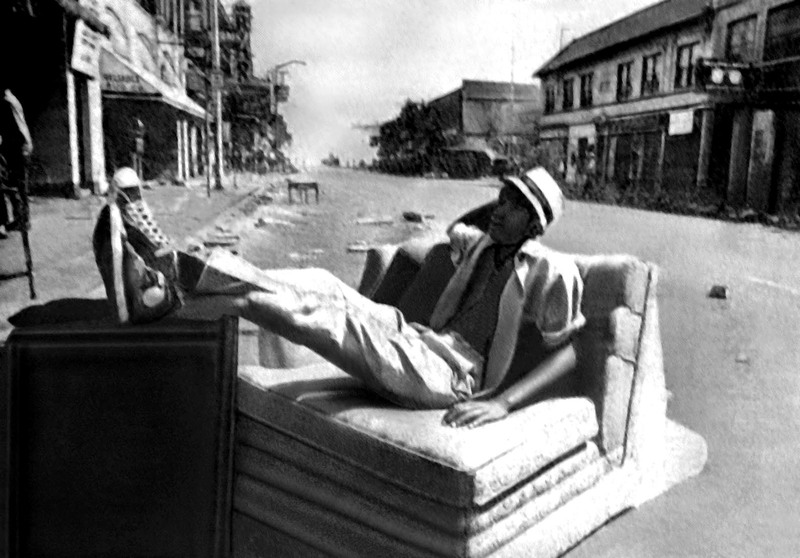 We didn't know about the riots TV was not watched back then; but were never again allowed to bus it to Detroit for lunch and shopping at Hudsons--these trips now requiring adult escorts. 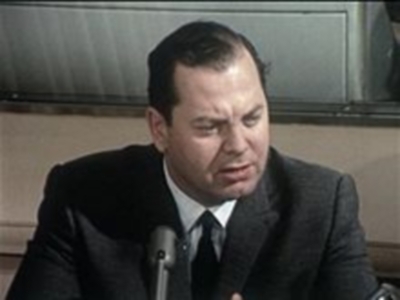 Fifty years later, realize I lived through a false flag--that's what it was. . . by any other name. Cuckservatism is worse than Progressivism.